Q: Hi Dmitry! Can you tell us about yourself and what you're working on? Hi everyone! My name is Dmitriy Lavrov. I’m from Russia. I’m 34 year old and for many years I have been a fan of the financial markets and everything around them. I have been trading since 2007 and since then I got some experience which I try to share now with beginner traders. To become a full time trader, investor and mentor, I started like everyone should: I took an educational course. “Analysis of financial markets and trading in financial instruments” and that was my introduction to this world. I then proceeded to read a ton of books and spent way too much time in front of monitors watching the price movements in different markets. Nowadays, I think a lot about proper trading and investing and I share my ideas with my communities on TradingView and Tradunity. On TradingView I started posting about 2 years ago. I soon noticed I was getting a lot of questions from people who just started trading. Since teaching is one of my passions, I began to think to start a new project which would be helpful for beginners. This project is Tradunity – a social network, a community for everyone who is interesting in profitable trading and investing in cryptomarkets. At this moment, it is the main project I work on. Q: What are the main differences between trading stock and cryptocurrency? I think the main difference is that cryptomarkets allow to make profit very quickly. Also, they are good for newbies and they are more predictable than Stock. Allow me to explain why I think so: when trading stocks, you must be an educated trader with an exact plan. You should always know what you will do next and always prepare your strategy. Any mistakes can defeat you and it is very easy to reduce your capital considerably, by using leverage trading. The stock markets look more unpredictable if we compare them with cryptomarkets. So, unless you are a skilled trader or investor, making profit in long run is not easy. Crypto markets allow you to make some mistakes and still be in good profit. Buying on tops in the beginning of 2017 could bring you huge profit later on. Trading strategies like “Buy and Hold” are very simple and profitable for novice traders. This works most times, but, of course, it does not mean that you can make profit all the time, without the proper knowledge. As in any other field, knowledge is the key to success. Q: What are your main trading strategies? I have several trading strategies. They allow me to trade in different markets conditions, on different markets and time frames. I prefer middle and long term trades and I try to catch swing movements. And yes, I’m a little HODLER too. I don’t close all positions when the price reached my profit targets and keep a small part of the trade volume for the long run. I do it only on the markets which have good potential for upward movement in the long run. Q: Is trading a nervous job? How do you deal with stress? Trading should not be a nervous job. Let’s pause and let that sink in. If you are stressed, it means you are doing something wrong. Maybe (and I mean probably) you are using a wrong money management technique or maybe you focus too much on the recent trading results. But if you have a proven trading plan and you set your strategy so that you know what to do – trading becomes a very simple and interesting job. Trading should not be a nervous job. Most people get stressed when they start to lose a few trades, especially after they had a winning streak. They must not: losing some trades is part of pro trading. They should focus on the long run result, which, with a proper strategy should have a positive outcome. Losing some trades is part of pro trading. I don’t get stressed by trading. Yes, sometimes I don’t like it when I see markets fall but I know that the only thing I need to do in this moments is to buy, not to stress out. In trading you must control your emotions, because emotions make you take wrong decisions and make mistakes. Don’t forget about this. Q: Tell us about Tradunity. 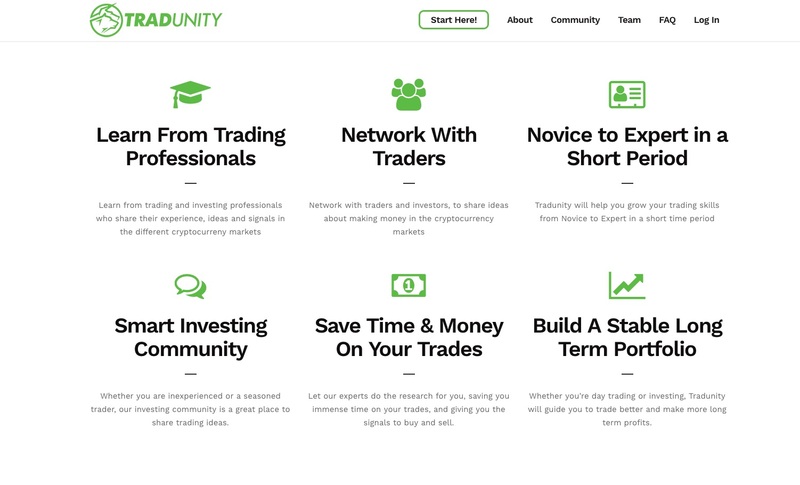 Tradunity.com is a project which was made for people who are interested in cryptocurrencies, and who want to take the opportunity to get profit from trading or from investing in the cryptomarkets. It has been one crazy ride so far! We started on the 7th of January with a team of only 2! And now, we already have 10 people with strong backgrounds helping us on the content and technical sides of this project. What we did was to create a community where newbies can find everything they need for proper and profitable trading. We provide them high-quality content from our experts who are experienced traders, analysts and investors. The members of Tradunity can get trading signals, read reviews about the current market conditions and ICO projects and learn from us. We give them weekly lessons and help them to grow their trading skill. Our target is to open new opportunities for everyone who wants to start trading in the cryptomarkets in order to change their lives and become financially independent. The great part about this project is that if we get people who just began trading onboard we can teach them the good practices right away and protect them from losing their capital. Statistically, most people lose in trading, and we give our members the tools to be on the winning side! Q: Does technical analysis work on crypto markets? Sure, why not? All financial markets are the same in general. You can find little differences, but TA works for all markets where people trade. 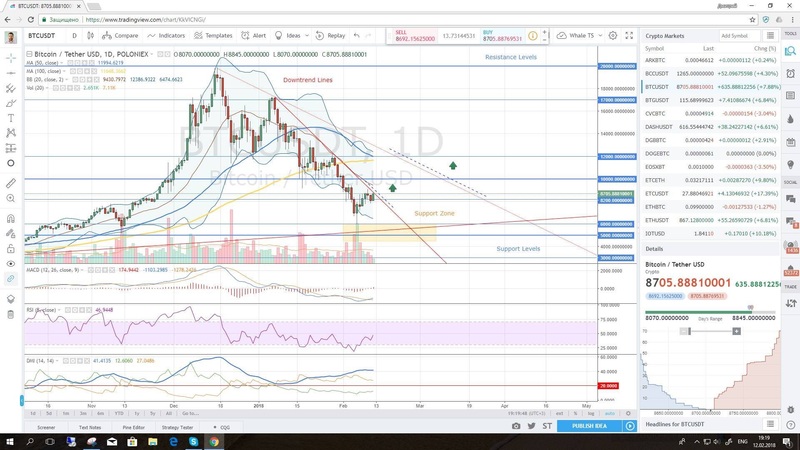 TA helps to see people’s behavior and it gives us an understanding of what to do next in the market. People’s behavior is the same in regardless which markets they trade in, and that is why TA can be used in cryptomarkets too. Q: Will AI (Artificial intelligence) powered platforms replace all the traders in future? Probably, in 10-20 years it can be so. But I still believe that people are much smarter than AI. On the other hand AI is much more disciplined. A combination of a smart trader aided by a strong AI is a really great idea! Should we build it? Q: Is that true that everyone can earn money on crypto trading? It is absolutely true. Everyone can get money from crypto trading if you will do it properly. However, for this, you must first learn and earn your knowledge. Everyone can get money from crypto trading. You must always have a trading plan which relays on proven trading strategies and money management techniques. Afterwards, you have to also follow your trading plan, day by day. Q: Where should one go to learn about crypto? Practice makes perfect but don’t practice wrong techniques. It is better to use an educational course which will give you a strong base: the main aspects of trading in crypto markets. You should also pass through the theory of Technical and Fundamental Analysis for Stock and Forex. There are many good learning sources out there and you should find the one that has the right approach for you. At Tradunity we try a practical approach: you can use the theory we teach directly with the trading signals or the investment analysis we provide. And there’s always someone to ask when in doubt. Books by famous authors about trading in Forex and Stocks are also valuable resources. Sometimes people are surprised that the theory is similar for Forex, Stocks and Crypto. I think it’s normal, as the main theory is the same for all financial markets. The differences are in a few details, but in my opinion, they are not so important. Q: Which tools do you use for trading? I use charts from TradingView to make my analysis, spreadsheets for some calculation and notes, Twitter for getting the main news and Crypto Exchanges for trading. Nothing more. Q: How do you secure your funds? I use a cold wallet Trezor. I use several exchanges for keeping the part of capital. I trade on Poloniex, Bittrex and Kraken. But I can’t say that I trust them completely. Simply because there are no crypto exchanges which can be reliable and trusted at the same level as the broker companies in Forex and Stock. There are no crypto exchanges which can be reliable and trusted at the same level as the broker companies in Forex and Stock. 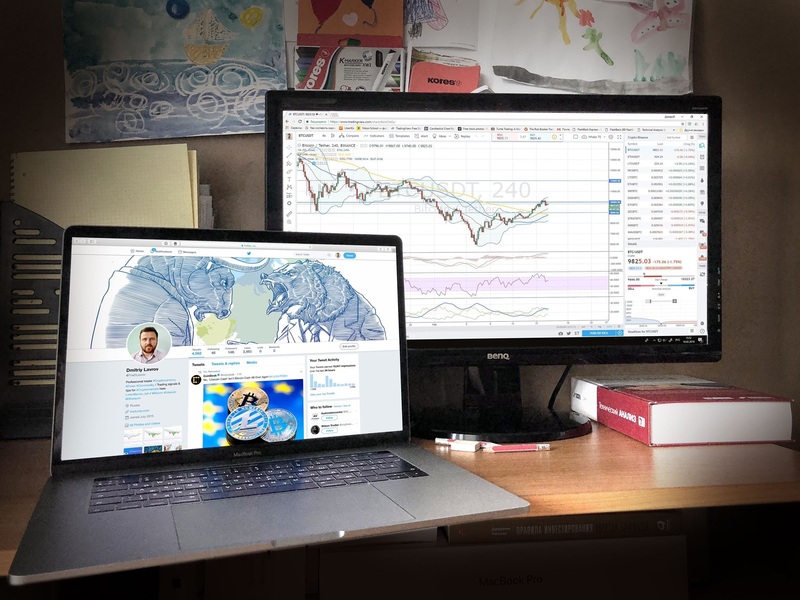 I use only TradingView charts to search for trading opportunities and to make my analysis and for that, I use my MacBook Pro and my PC. Nothing more :). Q: Mention 3 blockchain links of your choice. I like the idea of this project. It will connect the Crypto world with the real one and make using cryptocurrencies more comfortable. We don’t have solid infrastructures in crypto now and this project will be able to solve this problem. With a stable working trading platform, auto trading and social trading, they will move the cryptocurrency trading on a higher level! It’s going to be spectacular! The word which changed the World in 2017 year and opening many new opportunities now. Serious generous and modest person is Mr LAVROV, I thank him for all the help and support I learned more about trading and I learn more with his methods and pedagogic explications in https://tradunity.com and https://www.tradingview.com web site, the majority of the signals he post are successful.